The aim of this study was to evaluate the potential diagnostic usefulness of the full-length recombinant Toxoplasma gondii MAG1 protein by determining the levels of specific IgM and IgG antibodies in mouse and human sera obtained from individuals with acute and chronic toxoplasmosis. The obtained results revealed that IgG antibodies against MAG1 are a sensitive and specific marker of T. gondii infection since the protein was recognized by both mouse and human sera, 100% and 94.3%, respectively, rendering the full-length rMAG1 a prospective alternative for the polyvalent native antigen (TLA). 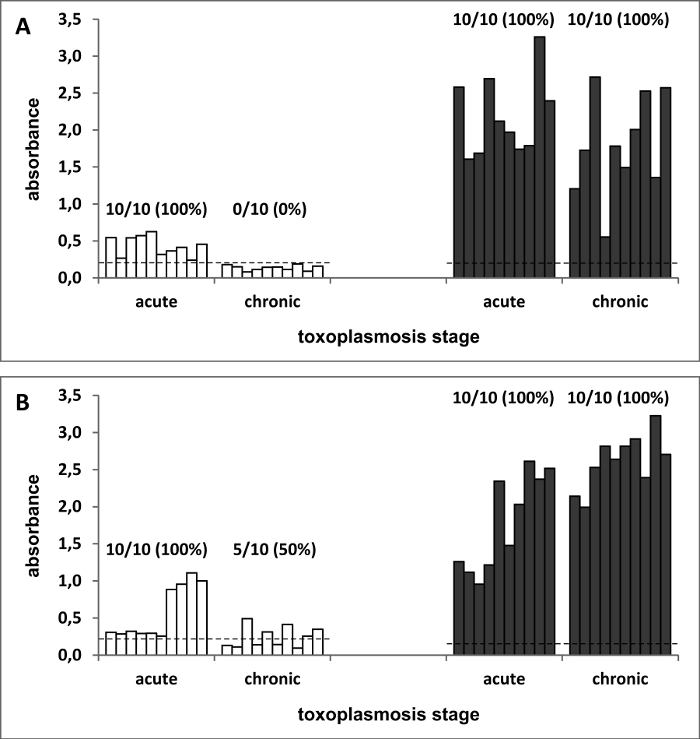 Clinical diagnosis of Toxoplasma gondii infection, one of the most common parasitic zoonoses worldwide, relies primarily on a two-step procedure involving detection of specific antibodies (mostly IgM and IgG) and consecutive estimation of IgG avidity to distinguish between acute and chronic invasion in individuals with circulating anti-Toxoplasma IgM immunoglobulins. Despite certain disadvantages, serological tests, in fact simple and relatively inexpensive, remain the main method for laboratory recognition of toxoplasmosis (Montoya, 2002). Most commercial tests use the Toxoplasma lysate antigen (TLA) obtained from in vivo or in vitro cultured tachyzoites, which is costly and differs from batch to batch. These drawbacks may be overcome with the use of recombinant proteins offering an efficient, well-defined and standardized diagnostic tool enabling the comparison of results from different laboratories, reliable estimation of specific antibodies in samples taken from one patient at long time intervals and, possibly, discrimination between acute and chronic invasion. To date, several T. gondii recombinant proteins have been developed and assessed for their diagnostic utility (Kotresha and Noordin, 2010; Holec-Gąsior, 2013). The 65 kDA MAG1 antigen of T. gondii is localized mainly in the matrix and the wall of tissue cysts and is considered a bradyzoite marker, however, it is also synthetized in tachyzoites (Ferguson and Parmley, 2002). Previously this antigen was tested individually, as a part of an antigen mixture or even as a chimeric protein revealing discrepancies which may have resulted from: different test models (humans and animals), applying various fragments of the amino acid sequence and the estimation of only one class of specific antibodies (Di Cristina et al., 2004; Holec-Gąsior et al., 2012, 2014; Xiao et al., 2013). Thus, the objective of the present study was to evaluate the diagnostic value of the full-length rMAG1 antigen expressed in the Escherichia coli system to detect both IgM and IgG antibodies, using concurrently human and mouse immune sera, the latter isolated at a defined time point of an experimental infection. For the cloning of the recombinant MAG1 antigen standard molecular biology protocols were used (Sambrook and Russell, 2001). Briefly, the 3’ fragment of mag1 gene (U09029) of T. gondii encoding 424 amino acids (from 33aa to 452aa) and including 3 amino acids of exon 2 and the whole exon 3 was PCR amplified using the T. gondii RH strain DNA as a template and cloned initially into a pJET1.2/blunt vector (CloneJET PCR Cloning Kit, Fermentas), verified by sequencing and finally cloned into the pHis expression vector using BamHI and HindIII restriction enzymes since the restriction enzyme recognition sites were incorporated into a sequence of primers (underlined sequences) (5’- GGATCCGCTGAGCCAAAGGGTGCCAGAGCTACCAGAAGTG; 5’- AAGCTTTCAAGCTGCCTGTTCCGCTAAGATC). The resultant vector pHis-mag1 was introduced into E. coli BL21 (DE3) cells to express the recombinant protein containing a 6-His tag within an extra 28 amino acids at the N-terminus. The expression and purification of rMAG1 were performed using a protocol described previously (Dziadek et al., 2011). Briefly, transformed E. coli BL21(DE3) cells were grown in LB broth containing ampicillin and IPTG as an inductor and next they were harvested and lysed. The recombinant MAG1 protein, present in inclusion bodies, was isolated using the His-Bind Buffer Kit (Novagen) containing 6 M of urea, under denaturing conditions, and then purified by Ni(2+) affinity chromatography on His-Bind columns (Novagen), according to the manufacturer’s procedures. The efficacy of purification was confirmed by 12% SDS-PAGE, staining with Imperial Protein Stain (Pierce) and Western-blot using anti-His antibodies (Novagen) (Fig. 1). Although two bands corresponding to the theoretical mass of 49.7 kDa were detected, the main portion of the protein formed a band of approximately twice the predicted mass, as noted previously (Hiszczyńska-Sawicka et al., 2010). The amount of recombinant MAG1 was evaluated by the Bradford technique, yielding approximately 30 mg per liter of culture. Fig. 1. 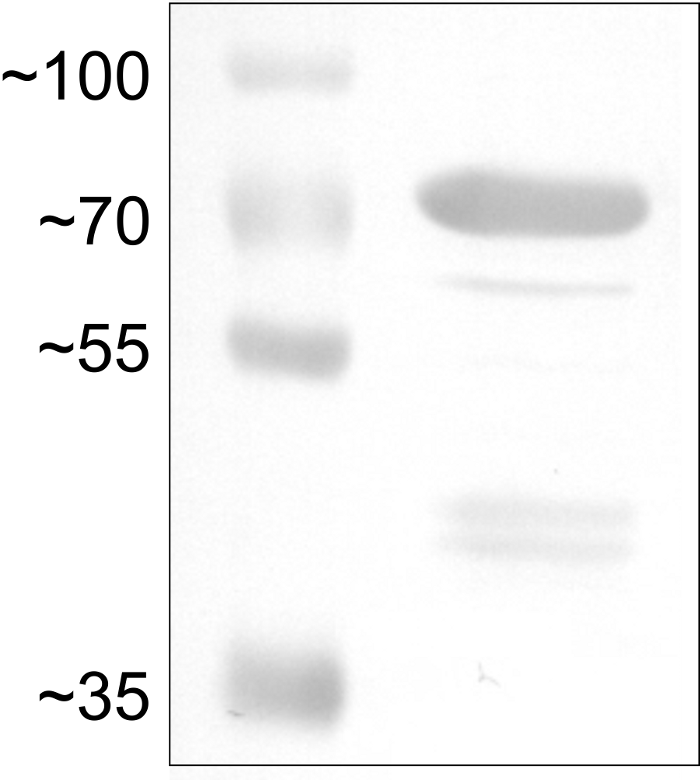 Western blot analysis of the rMAG1 protein. Recombinant protein was detected using specific anti-His antibodies (line 2) and compared to the protein marker (line 1). To obtain mouse immune sera 10-12 week-old male C57BL/6 (naturally more susceptible to T. gondii infection) and BALB/c (naturally more resistant to T. gondii infection) inbred mice, were inoculated intraperitoneally with 5 low virulent T. gondii DX strain cysts isolated from the brain of a latently infected C57BL/6 mouse by mechanical homogenization of tissues and gradient separation, as described before (Gatkowska et al., 2006). Serum samples were collected from uninfected animals (negative controls) and mice with acute (3 weeks post inoculation) and chronic (6-8 weeks post inoculation) toxoplasmosis. All experimental groups consisted of 10 animals and each procedure was approved by 9. Local Ethics Commission in Łódź. Human serum samples were obtained from routine diagnostic laboratories and were classified as positive or negative based on the levels of specific IgM and IgG antibodies according to the diagnostic test description. Furthermore, all T. gondii positive sera were divided based on their IgG avidity value (determined either by the diagnostic laboratories or in our laboratory with commercially available NovaLisaTM T. gondii IgG Avidity Test, NovaTec Immundiagnostica GmbH) into an acute (n = 33, IgM+ and IgG+) and a chronic (n = 72: 34 IgM+ and IgG+; 38 IgM– and IgG+) group. Sera considered seronegative were used as controls (n = 21). To determine the amount of specific anti-MAG1 antibodies in the test sera, the immunoenzymatic test was used according to the procedure described previously (Gatkowska et al., 2006). Briefly, the serological MaxiSorp plates (NUNC) were coated with the recombinant MAG1 antigen, at the optimal concentration of 0.5 mg/well, established in the preliminary experiments. The immune and control sera were diluted 1:100 and the immunoenzymatic reaction was developed with goat anti-human and anti-mouse IgM or IgG antibodies (Jackson ImmunoResearch) labeled with horseradish peroxidase-HRP, the chromogene – ABTS (Sigma-Aldrich) and H2O2 as a substrate for HRP (Sigma-Aldrich). From the absorbance values obtained for negative control sera, both human and mouse, the cut-off values were calculated as the mean absorbance + 2 standard deviations. Immune sera reactivity with the recombinant MAG1 antigen was considered positive if the OD exceeded the cut-off value. The statistical analysis of the results was performed with the U Mann-Whitney test and differences were significant for p < 0.05. Since the aim of this study was to evaluate whether the full-length recombinant MAG1 antigen may allow both detecting T. gondii invasion and discerning its phase, the levels of specific anti-MAG1 IgM and IgG antibodies were determined in human and mouse sera. The results obtained in this work revealed that both mouse strains, regardless of their genetic background, in the course of natural T. gondii invasion produced both IgM and IgG antibodies reacting with the recombinant MAG1 protein. As presented in Fig. 2, the response to MAG1 was detected as early as in acute infection in all subjects and it was represented by IgM and high levels of IgG antibodies (p < 0.001, compared to negative controls in both antibody classes and mouse strains). Fig. 2. Levels of IgM (□) and IgG (■) antibodies in individual C57BL/6 (A) and BALB/c (B) mouse sera recognizing rMAG1 antigen during acute and chronic toxoplasmosis. —— – cut-off values. However, during the chronic phase of toxoplasmosis the IgM level fell below the cut-off value in all C57BL/6 mice and in 50% of BALB/c mice, and statistical analysis showed no differences between infected and uninfected groups (p = 0,427 for C57BL/6 and p = 0.734 for BALB/c) suggesting that IgM antibodies produced in response to the native MAG1 antigen are rather short-lived. On the other hand, the IgG levels either remained stable (C57BL/6 mice, p = 0.212) or even rose slightly over time (BALB/c mice, p=0.005). The results were further confirmed in tests with human serum samples. Although people represent a much more heterogeneous population compared to laboratory inbred mice, the sensitivity of the test detecting anti-MAG1 IgG antibodies was again high both in acute and chronic T. gondii infection, 97.0% and 93.1% respectively (Table I). The percentage of MAG1-positive human samples taken from patients with acute or chronic T. gondii infection. Noteworthy, the lowest sensitivity was obtained with the serum samples from chronic T. gondii infection stage that did not contain specific IgM antibodies (89.5%). IgM anti-MAG1 antibodies appeared in the majority (63.6%) of subjects classified as acutely infected and only 14.7% of chronically infected individuals with circulating IgM anti-T. gondii antibodies (determined by commercial tests). Sera from chronic stage of toxoplasmosis classified as IgM– IgG+ generally did not contain specific IgM antibodies reacting with the rMAG1 protein, however, one false positive result was recorded. The outcome of serological tests applied commonly in the laboratory recognition of toxoplasmosis depends heavily on the diagnostic antigen used. Most commercial tests use TLA (Toxoplasma lysate antigen) obtained from parasite tachyzoites, which in fact has a few drawbacks, such as high costs, culturing of invasive parasites and lack of standardization. All these disadvantages may now be eliminated by the use of DNA technology enabling a production of recombinant proteins. The present study focused on the diagnostic potential of the full-length rMAG1 protein tested concurrently in laboratory mice and humans. Based on a strictly defined experimental model (murine toxoplasmosis), we confirmed that the native MAG1 is highly immunogenic. In our study the full-length protein proved to be a sensitive marker of T. gondii invasion, in both acute and chronic stages, reaching the overall IgG test sensitivity of 94.3 % in humans and 100% in laboratory mice. There is a discrepancy between our results and those reported by other authors. Holec et al. (2007) found that the rMAG1 antigen was much more frequently recognized by specific IgG antibodies present in human sera derived from the acute stage (97.3%) than by those from the chronic stage (only 7.5%) of toxoplasmosis. However, a much shorter fragment of the rMAG1 protein comprising a sequence from 30 to 222 amino acids was applied. This short rMAG1 fragment was excluded from a further study at the stage of preliminary experiments due to its unsatisfactory reactivity with ovine sera (Holec-Gąsior et al., 2014) and it exhibited high IgG sensitivity (90.8%) in tests with both acute and chronic human serum samples when accompanied by a fragment of another T. gondii antigen (MIC1) in the chimeric protein (Holec-Gąsior et al., 2012). Similarly to our observations, authors (Holec-Gąsior et al., 2012) also noted the lowest sensitivities of IgG tests in samples from chronic toxoplasmosis containing low concentration of specific antibodies. Di Cristina et al. (2004) analyzed the immunoreactivity of the glutathione S-transferase fusion protein containing MAG1 fragment with sera from T. gondii-seropositive women. Results revealed that IgG antibodies from 73% of tested individuals reacted with the rMAG1 antigen indicating broad recognition of bradyzoite antigens by human B-cells. Furthermore, the rMAG1 antigen (30–452 amino acid residues) was also used in a recombinant “line assay” performed on nitrocellulose, but the sensitivity of IgG detection in sera from individuals with acute infection was low (31.8%), compared to our results, with specific antibodies arising over time (Pfrepper et al., 2005). Noteworthy, it has been found recently that the MAG1 of Neospora caninum (NcMAG1) is 54% identical to the MAG1 of T. gondii (TgMAG1) with the conserved C-terminal regions exhibiting 66% identity and the variable N-terminal about 32% suggesting that these variable regions possess unique antigenic characteristics (Guionaud et al., 2010). To summarize the MAG1 protein offers a promising alternative to replace a TLA preparations in diagnostics due to its high sensitivity in specific IgG detection. Moreover, a combination of protein fragments differing in their length may be useful in discriminating between acute and chronic invasion just by determining the IgG reactivity. Additionally, the recombinant MAG1 peptides (107-148 and 422-452 amino acid residues) have the potential to distinguish active from chronic infection (Xiao et al., 2013). Finally, the results of experiments on chronically infected mice non-treated and treated with sulfadiazine to inhibit cerebral tachyzoite proliferation (Hester et al., 2012), led authors to speculation that detecting increased levels of IgG antibodies against several T. gondii antigens (including MAG1) may offer an alternative method to detect reactivation of latent T. gondii invasion. The paper was partially supported by the Polish National Science Centre (grant N N 302 636340) and University of Łódź. Sambrook J. and D.W. Russell. 2001. Molecular cloning: a laboratory manual, 3rd ed. Cold Spring Harbor, NY: Cold Spring Harbor Laboratory Press.